Matthew Apgar - mapgar@shawmedia.com Realtor Suzanne Kotomski opens up the steel closet in the main bedroom of a Lustron home on Monday, March 19, 2018 in McHenry. 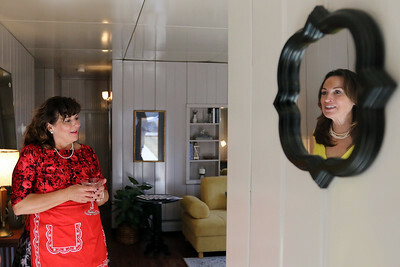 Lustron homes were 1950's era prefabricated homes constructed of steel, and realtor Suzanne Kotomski and Laura Herne, daughter of the home's owner, were dressed in era clothing to go along with the decor of the same era. 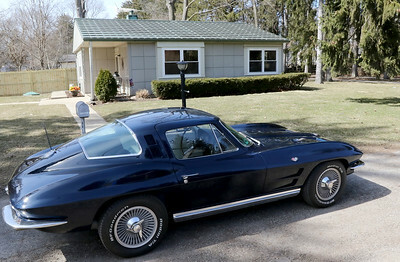 Matthew Apgar - mapgar@shawmedia.com A 1964 Chevrolet Corvette Stingray owned by George Lamm sits outside a Lustron home as part of realtor Suzanne Kotomski's efforts to stage the house in an older era on Monday, March 19, 2018 in McHenry. Lustron homes were 1950's era prefabricated homes constructed of steel. Matthew Apgar - mapgar@shawmedia.com Laura Herne (center) talks with realtor Suzanne Kotomski (right) in the basement of a Lustron home on Monday, March 19, 2018 in McHenry. Lustron homes were 1950's era prefabricated homes constructed of steel, and Kotomski and Herne, daughter of the home's owner, were dressed in era clothing to go along with the decor of the same era. 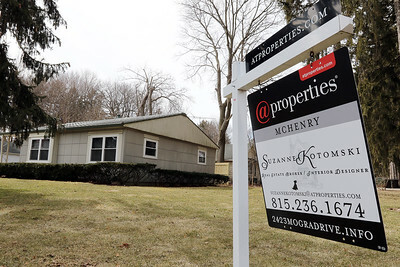 Matthew Apgar - mapgar@shawmedia.com A for sale sign sits outside a Lustron home on Friday, March 15, 2018 in McHenry. Lustron homes were 1950's era prefabricated homes constructed of steel. Matthew Apgar - mapgar@shawmedia.com The living room of a Lustron home on the real estate market is staged for the era on Monday, March 19, 2018 in McHenry. Lustron homes were 1950's era prefabricated homes constructed of steel. Matthew Apgar - mapgar@shawmedia.com Laura Herne (left) heads downstairs as she and realtor Suzanne Kotomski discuss the steel construction of the Lustron home on Monday, March 19, 2018 in McHenry. Lustron homes were 1950's era prefabricated homes constructed of steel, and Kotomski and Herne, daughter of the home's owner, were dressed in era clothing to go along with the decor of the same era. Matthew Apgar - mapgar@shawmedia.com Laura Herne points out an original Artcrest seal on a steel pantry inside a Lustron home on Monday, March 19, 2018 in McHenry. 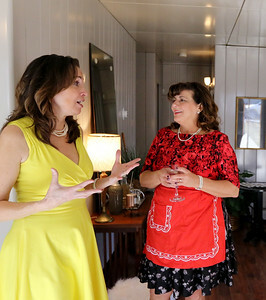 Lustron homes were 1950's era prefabricated homes constructed of steel, and realtor Suzanne Kotomski and Herne, daughter of the home's owner, were dressed in era clothing to go along with the decor of the same era. Matthew Apgar - mapgar@shawmedia.com Laura Herne (left) and realtor Suzanne Kotomski (reflected in mirror) talk in the living room of a Lustron home on Monday, March 19, 2018 in McHenry. 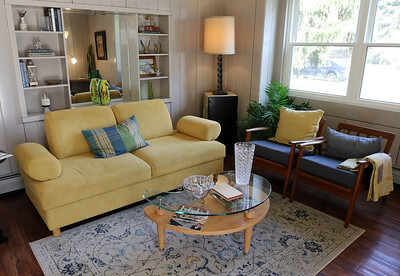 Lustron homes were 1950's era prefabricated homes constructed of steel, and realtor Kotomski and Herne, daughter of the home's owner, were dressed in era clothing to go along with the decor of the same era. Matthew Apgar - mapgar@shawmedia.com Realtor Suzanne Kotomski (left) and Laura Herne talk in the living room on Monday, March 19, 2018 in McHenry. Lustron homes were 1950's era prefabricated homes constructed of steel, and Kotomski and Herne, daughter of the home's owner, were dressed in era clothing to go along with the decor of the same era. Laura Herne (center) talks with realtor Suzanne Kotomski (right) in the basement of a Lustron home on Monday, March 19, 2018 in McHenry. Lustron homes were 1950's era prefabricated homes constructed of steel, and Kotomski and Herne, daughter of the home's owner, were dressed in era clothing to go along with the decor of the same era.